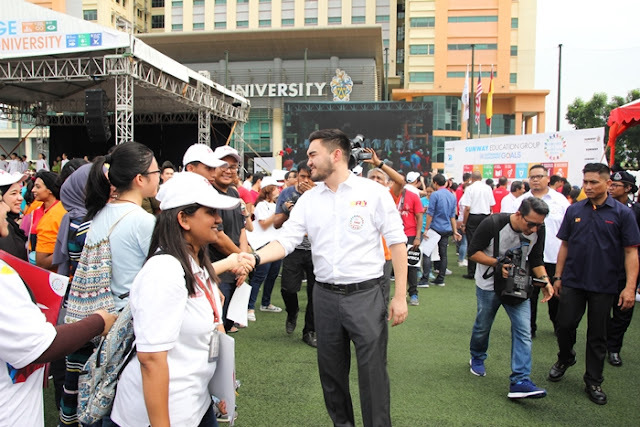 Here the largest celebration ever to commemorate the United Nations Sustainable Development Goals (UNSDGs), 8,165 Malaysians held hands all around Sunway City marking the 3rd UNSDG anniversary, since its launch on 25th September 2015. The number 8,165 represents the nautical miles from Sunway University to the UN’s headquarters in New York. 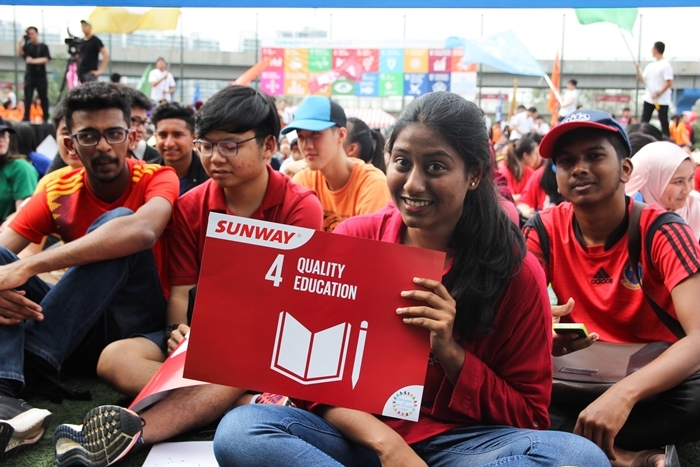 With Sunway University being the centrestage for the event, all around Sunway City, people formed groups in the City’s key locations, including Monash University, Sunway Medical Centre, Sunway Lagoon, Sunway Hotel and Sunway Pyramid, to hold hands in support of the SDG goals. At the centrestage, the event began with 17 speakers each taking the stage for a one-minute address regarding one Sustainable Development Goal. “Economic growth must be inclusive to provide sustainable jobs and promote equality. Social protection systems need to be implemented to help alleviate the suffering of disaster-prone countries and proveide support in the face of great economic risks. These systems will help to end extreme poverty in the most impoverished areas,” he added. Malaysian singer songwriter Reshmonu spoke for Goal 2- Zero Hunger; Managing Director International SOS & Deputy Chairman of British Malaysia Chamber of Commerce. David Ng spoke for Goal 3 - Sunway Education Group senior executive director Dr Elizabeth Lee spoke for Goal 4 – Quality Education; CIMB Foundation CEO Dato’ Hamidah Naziadin spoke for Goal 5 – Gender Equality; Subang Jaya state assemblywoman YB Michelle Ng spoke for Goal 6- Clean Water and Sanitation; Netherlands Ambassador HE Karin Mossenlechner spoke for Goal 7 – Affordable and Clean Energy. BDO Regional senior partner Dato’ Gan Ah Tee spoke for Goal 8 – Decent Work and Economic Growth; PwC partner Hilda Low spoke for Goal 9 – Industry Innovation and Infrastructure; and Deloitte Country Managing Partner Yee Wing Peng spoke for Goal 10 - Reduced Inequalities. HSBC CEO Stuart Milne spoke for Goal 11 – Sustainable Cities and Communities; Godfather of Comedy Harith Iskandar spoke for Goal 12 – Responsible Consumption and Production; National Geographic Explorer filmmaker Rachel Quek Siew Yean spoke for Goal 13 – Climate Action. SEA Games Medal Winner, Sin Li Jane spoke for Goal 14 - Life Below Water; Sunway Group Executive Director, Sarena Cheah spoke for Goal 15 – Life on Land; President of JCI, Professor Datuk Woo Wing Thye spoke for Goal 16 – Peace, Justice and Strong Institutions; and Trustee of Jeffrey Cheah Foundation, Tunku Abidin Muhriz spoke for Goal 17 – Partnerships for the Goals. A countdown then ensued, ending with the Sustainable Development Goals anthem being played in the field with SEA Games athletes and Sunway Universities’ scholars waving giant colorful 17 SDG flags. 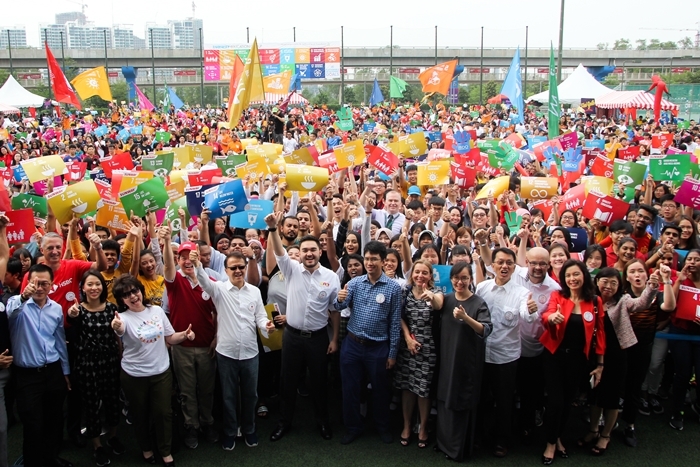 Simultaneously, the celebrities, ambassadors, government leaders, representatives from corporations, and people from all walks of life joined in, and swayed in tune to the music, symbolising their pledge to support the UNSDGs, and their committment toward creating a better world for the current and future generations to come within the key areas for progress. “It is our hope that this significant public display of support, sheer magnitude of the event and the thousands taking part willl ensure that our message will echo across the nation – that we are all in this together, and we must act now for our future,” said Tan Sri Cheah. “It is now our turn to carry on their mission; and to be the difference we want to create for the world,” Dr Lee said. Post the joining of the hands, the mammoth celebration also saw some magnificent performances. Famous opera singer Solomon Chong wowed the crowd with his impressive vocal range, which was followed by a dance troupe of 40 young performers that showcased two songs. The Malaysian Military Band delivered a very special performance for the crowd. All 8165 participants were presented with a certificate of participation and SDG badges, as a memento of the unique event. Why I love Flower Chimp! What are Mala Beads and why do Yogis Wear Them?